I’ve been trying to avoid blogging too much about Evan. I’ve written about him some, sure, but I didn’t want to overdo it. Why? Partly because I didn’t want to be That Guy who only ever talks about his kid and how adorable he is. And partly because I want to respect Evan’s privacy. 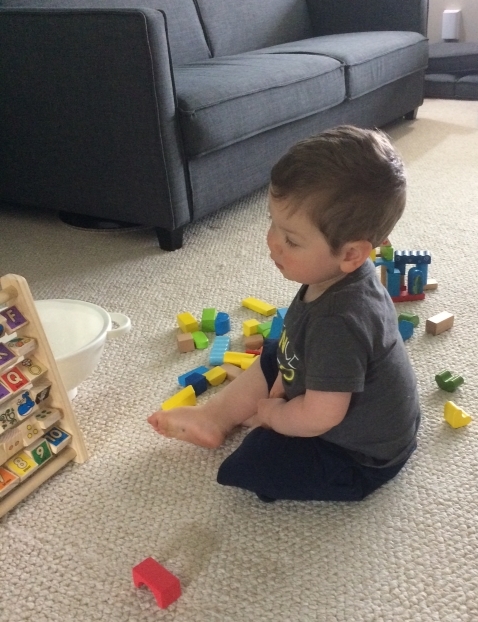 Sure, at 19 months old, he doesn’t have a concept of privacy yet — but he will someday. I would certainly be less than thrilled, myself, if a blog was still floating around from circa 1986 in which my parents talked about what kinds of things made me cry, or what color my poop was. But I’ve had to re-evaluate this strategy. First of all, let’s be honest — aside from Evan, my life isn’t terribly interesting right now. Sure, I’m still working on Crane Girl, but updates on a novel-in-progress are not necessarily edge-of-your-seat material (especially since I’m trying to avoid specific details of plot and characters). I’m still doing my editing work, but unless you want to hear about spreadsheets full of numbered photos in textbooks, that’s probably not riveting either. I’m a dad now. Evan forms a large part of my identity. And I’m pretty sure I can talk about him without being too invasive. Right? So what about the little munchkin, anyway? I’ve been struck lately by how pure his emotions are. Adult emotions are almost always watered down to some extent. Joy is rarely 100%, because we know nothing lasts forever. We rarely give in to sadness completely, because we worry about how others will judge us. It’s mostly shades of gray. But when Evan’s upset, it’s an unalloyed sorrow, with total control of his mind, body, and heart. His lungs convulse with sobs so hard he has to pause for breath. The most basic problem of human life — that what we want does not equal what is — still cuts razor-sharp, not yet dulled by endless repetition. When he’s interested in something, he looks as serious and careful as a professor. And when he’s happy, his excitement is so intense it sometimes almost seems to break him. He recently encountered something called a balloon, which goes up instead of down, and he nearly lost control of his body in the rush of absolute shock and delight. I don’t remember the last time I felt that way. I hope I feel it again someday. And if not, I hope I can help him feel it some more. Um… I’ve been meaning to tell you about a blog that I started just after you were born. Well, it wasn’t a blog then because that wasn’t a thing yet. But I posted it all online as soon as I could. AOL I think. Maybe we should talk about that. Ooh! Did it have an animated hit counter? ?